Need more information about booking Home 9374835 ? 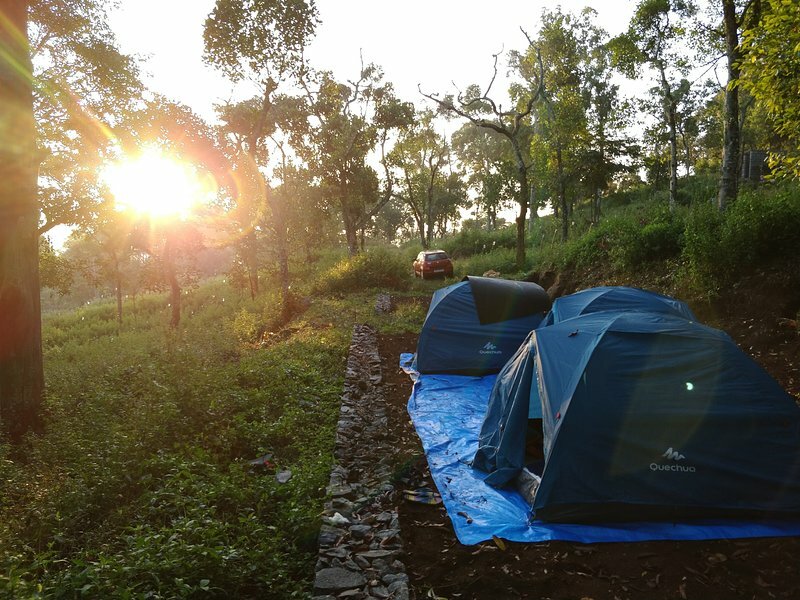 Campsite with Tent provided for your adventurous stay in the coffee estate. Each tent can accommodate 4 persons. We can setup up to 8 tents. You can experience Natural Organic Farming of Coffee, Banana, Orange, Pepper and Vegetables. You will have access to adventure sport activities (extra cost). You’ll love my place because of the views and homely hospitality. Our place is good for couples, solo adventurers, and families (with small kids). The base price of Rs 1000 per head includes breakfast. Only Kids up to the age of 5 can be accommodated for free. Campground with pads for tent sites. Weatherproof tents and bedding provided for your comfort. You will have access to shared Toilets and bathrooms. You can get in touch with Sripriya (the owner) through the contact form on this page. Send Sripriya (the owner) an email through the contact form on this page. Alternatively, if there’s a phone number on this page, you can call them. How do I contact Sripriya (the owner)? If you’ve already booked, go to Manage your holiday booking to view Sripriya the owner's contact details or send them a message. Or send Sripriya (the owner) an enquiry through the Contact the owner/manager form if you’d like a quote or more info first. When you pay online through the Book your stay form, a booking request is sent to Sripriya (the owner). You’ll find out within 24 hours whether they’ve accepted - no money will leave your account before then. You can also request a quote from Sripriya (the owner) through the contact form. The owner will email you the total cost for your dates and a link to book and pay online. Use the Book your stay form to pay provisionally online. You can pay by credit/debit card or PayPal. Sripriya (the owner) will have 24 hours to accept the booking and no money will leave your account before then. Why can't I call Sripriya (the owner) before booking? You’ll need to contact Sripriya (the owner) to do this. Send them a message in Manage your holiday booking or through the contact form on this page. You can request to change the dates or number of people on your booking via the Manage your holiday booking page. To change your holiday dates use the Edit booking button. If you need to change the number of guests staying then send Sripriya (the owner) a message. If Sripriya (the owner) agrees, they’ll send you a revised quote outlining the changes. You can review and accept/decline this from the Manage your holiday booking page. You’ll have 48 hours to take action before the revised quote expires.